Can depo-testosterone help build muscle? Yes. Clinical trials that have been published in some of the most well respected medical journals in the world have demonstrated that depo testosterone helps build muscle. 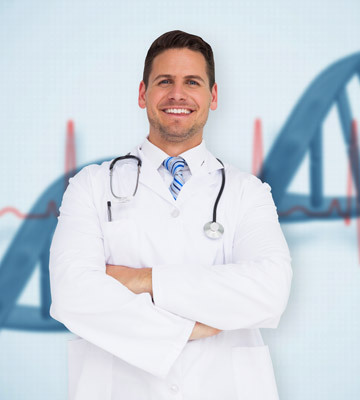 This is one of the most common and sought after benefits of testosterone replacement therapy (TRT) using the best, top quality depo-testosterone injections. These shots need to be prescribed by a licensed doctor after you have been tested to have low T and it is suspected that your ailments are being caused from this condition. Besides blood work, you will also get a physical exam and share your medical history. This will all be to confirm that you are a qualified candidate for TRT and will most likely get great results. By replacing lost testosterone in the male subject’s bodies, this increased fat free mass and muscle size. It also increased strength in those with low T.
The study was conducted for 10 weeks with testosterone delivered by intramuscular injections. Body weight and fat free mass were both measured by weighing participants under water. Muscle size was measured by magnetic resonance imaging. Body weight increased significantly after TRT, fat free mass increased and so did the cross sectional area of the men’s triceps (the muscles in the arms) and the quadriceps (the muscles in the top, front part of the legs). Muscle strength was also assessed by weight lifting exercises and proved positive to increase significantly as well. This study measured body composition and muscle protein synthesis before therapy and six months after testosterone replacement therapy. In all of the subjects studied there showed an increase in their fat free mass, a decrease in fat mass and muscle mass increased in all participants. The study showed clear proof that TRT benefited subjects in a number of different ways including increased muscle mass when they were given testosterone injections. Testosterone, which is produced in the testicle in men and in the ovaries in women (with a small amount being produced in the adrenal glands) is a 19 carbon hormone. How does depo testosterone build muscle? Then there is two to four percent of testosterone that is not bound to any proteins, but is free. This is known as "free testosterone.” This free testosterone is said to interact at the tissue level where it is changed in the cells into what is called DHT. This is simply a more potent androgen. What helps this free testosterone to convert? The enzyme 5 alpha reductase helps it. This is what aids depo-testosterone to build muscle. Within the prostate in the man, this conversion is said to be what creates physiologic effects such as growth of muscle mass. Those who should use depo-testosterone to build muscle are men or women over 30 who have low testosterone levels, but are in otherwise healthy shape. They can take advantage of how bioidentical depo- testosterone can build muscle. Testosterone is not for use for people under 30 years old because they should not be experiencing low T symptoms. They are still producing enough testosterone within their testicles or ovaries and if issues occur, they are most likely not due to low T.
Depo-testosterone should also never be used solely to build muscle. Some men wish to increase their muscle mass for a heftier physique if they body build or just want to look larger. TRT is not for use for this purpose. In fact, it is illegal to use depo- testosterone to build muscle fast if you do not have a testosterone deficiency as demonstrated in blood work. You must get a prescription for these kinds of injections or they are not legal to use. In addition, they will not be safe to use either. When a prescription is given for a man or women with low T, the patient will also receive medical supervision from a licensed doctor who prescribed the medication. This way they will be monitored for any negative side effects and if any do occur, they can be taken care of immediately. Can depo-testosterone alone build muscle? By following the doctor’s individualized treatment plan that is made for you when you become a patient of Greenberg Health, you will have the best chance of having prescribed depo- testosterone build muscle fast.